Learn the steps when trying to sell your home in a short sale. It’s a complex transaction that requires the scrutiny and approval of multiple parties within the bank. Below is an overview of the short sale process, Instructions for how to start a short sale, and what the bank does when they receive the short sale offer. A short sale is when the bank agrees to let the borrower’s property be sold for less than what the borrower still owes them. Example: If a borrower owes $200,000 on their home but the home is only valued at $170,000. The short sale will have to be regulated by the lender since they have a lien on the property and the debt will not be paid in full. Often times the property will be sold below the current market value due to the long and drawn out short sale process. With a short sale, the seller’s lender is the determining factor on whether or not an offer will be accepted. A short sale is kind of like the game Tetris. If everything falls into place the short sale can go through, but if one object does not fit correctly the whole process begins again. Incorrect or missing paperwork is one of the most common reasons for a short sale to fail. Find the contact information for your lender's loss mitigation department and contact them. Sometimes the bank will have the information on their website with further details of what they require for a short sale. After explaining your situation to your bank's loss mitigation specialist you need to request the paperwork needed to get the short sale started. You should be able to do this even if your property is in foreclosure. They will usually email, fax, or send you the paperwork by mail. Bank statements - Try to get statements dating back to the previous 3-6 months or longer if you can obtain them. It is better to have them and not need them, than to not have them and need them. Hardship letter - A letter that explains how and why the borrower is unable to keep up with their payments. Banks custom short sale package - Usually each bank will have a different looking short sale package. Payroll stubs - They usually require pay stubs from the previous 3 months. If you have direct deposit you may be able to show this in your bank statements. Tax returns - Preferably from the previous 2 years. Find a real estate agent in your area that specializes in short sales. They will help locate a buyer for the property. Not every agent will take on short sale cases because they can be frustrating. The bank will often require you to hire a real estate agent anyways. Most of the time banks will pay for the real estate agents commission of the sale. 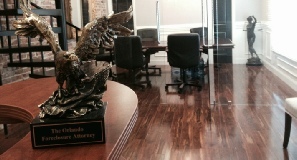 If you are in foreclosure hire a foreclosure defense attorney to defend your case. Contact an attorney soon as you are served. They can prevent the bank from foreclosing on your home while you work to get the short sale approved. * Only beneficial if your property is in foreclosure. Double check your short sale paperwork. Make sure everything is organized by date and easy to read. It is usually best to give each document a separate folder. Remember the bank has thousands of short sale offers to sift through so the less amount of time they have to spend sifting through your documents the faster you will get an answer. If you are unsure about anything, contact your lender before submitting your paperwork. You want all the paperwork to be correct first time. Submit your paperwork to the bank along with the completed short sale offer. Be proactive after submitting your paperwork. Don’t just wait around. You will want to contact the lender once a week to see what is going on and if there is anything that they still need from you. It’s also a good idea to have a back up offer because there is a high likely hood that they will reject the buyer’s first offer. People who are in the market for a home are usually eager to buy and move in. Because the short sale process is so lengthy buyers will often give up and move on. The negotiator will usually want a final update on the borrower's finances before recommending the offer be accepted or rejected. If the new home buyer and the bank agree on the price, the short sale is submitted for review by the bank's board of investors. Bank's loss mitigation department confirms all paperwork required is there and determine short sale eligibility. If it looks like the borrower financially stable the proposal will be rejected. The bank has a negotiator assigned to the property. 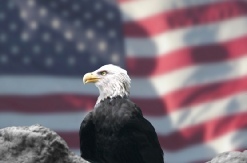 They order a Broker Price Opinion (BPO) to find out what the home is currently worth. This information is used to create a acceptable sale price range. Drive by BPO - A BPO licensed real estate broker will drive by the property and generally not exit their vehicle. They provide the bank information about the location, type of neighborhood, exterior condition of the home, age of the property, estimated square footage and number of rooms, the size of the lot, and 3 similarly sold comparisons. Internal BPO - Requires everything a drive by BPO has except the information is more in depth and confirmed. The Broker will actually enter the home for inspection and take pictures. If the short sale offer is within the acceptable sale price range provided by the BPO, the bank will send a property appraiser to inspect the home. 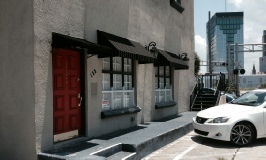 If the short sale is approved by the board of investors it will be formally accepted in writing. The seller will receive paperwork with the terms and conditions of the sale. It should lay out what is to happen with the deficiency (the leftover debt the seller owes the bank) and if you will be liable for it or not. If the bank decides to write off the debt they will issue you a 1099 form that you will have to submit to the IRS at the end of the year. The IRS sees forgiven debt as profit and will tax you on it. You the seller, are not allowed to receive any money from the sale of the property. The bank will also require you to sign a "arms length" agreement, which says the you have no affiliation with any party that would financially benefit from the sale. This includes, the buyer and real estate agent. You would not be able to sell the home to a friend or relative. Tip: Many banks have been turning to electronic systems like equator to help them with short sale paperwork. You may have to scan and upload your documents to a computer and upload them to their system online. Tip: Everything should point to an impossible situation of you being able to continue paying for the house. Don’t even entertain lowball offers. They will be rejected and just waste precious time. Be prepared with a increased back up offer for the lender. Be proactive: Frequently contact the lender to see if there is anything stopping the process. 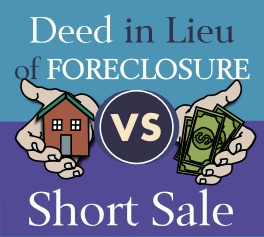 How do I Avoid a Deficiency Judgment when I do a Short Sale? Getting the bank to ensure that you will be forgiven of any leftover debt can take some serious convincing. This article contains an outline of the terms and agreements you will want the bank to sign and agree to. 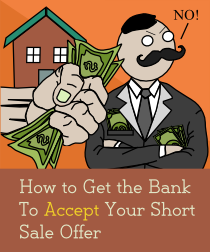 Learn how to force the bank to accept your short sale offer. Does the Bank have any incentive for accepting your short sale offer? Your short sale offer must be in the Bank's best interest before the Bank will even consider your proposal.